Tamil Nadu has a bit of everything, ancient temples, palatial mansions, ocean views, mountaintop hotels and a rich, cultural history. 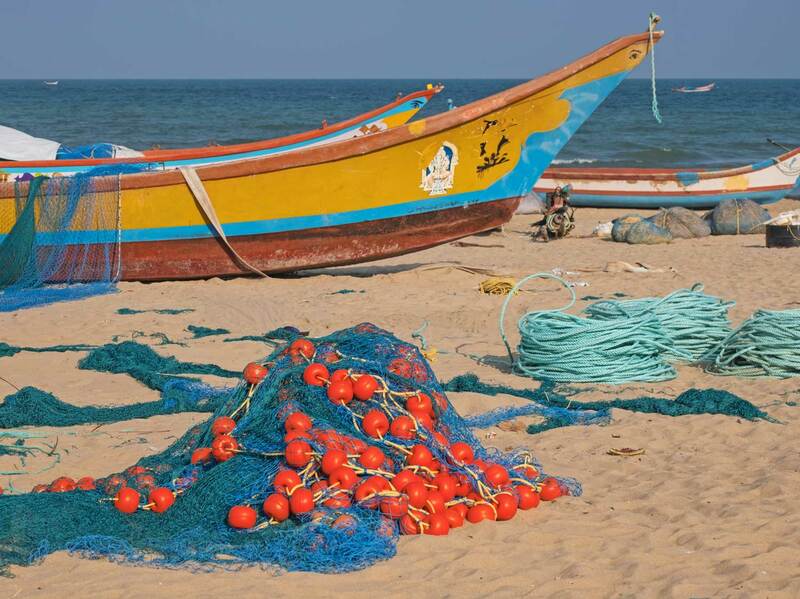 Local fishing boat and gear on the beach at Mamallapuram in Tamil Nadu, India. The main catches taken in the Bay of Bengal inshore fishery are pomfrets and prawns. You’d be hard pushed to find a more diverse, vibrant destination than Tamil Nadu, India’s most south-easterly state. 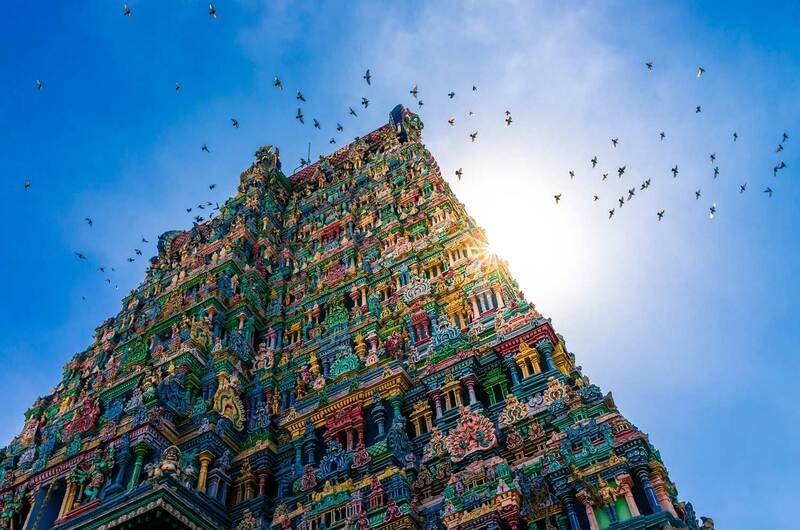 Like a microcosm of India as a whole, Tamil Nadu has a bit of everything: ancient temples, palatial mansions, ocean views, mountaintop hotels and a rich, cultural history. Think of the city of Puducherry (formerly Pondicherry) as the New Orleans of India. Lovingly referred to as ‘Pondy’, it was sporadically under French rule from the 1600s until 1954, and today its colonial French architecture still stands tall. In the old ‘French’ part of town, the buildings are painted in bright colours – yellow, orange, pink and red – and dressed in vivid pink bougainvillea. Hotels like Palais de Mahé, with its grand, yellow-toned colonnades so reminiscent of French colonialist architecture, reflect the cultural depth of the city. Pondy is known for its laid-back, bohemian-chic vibes, with people still speaking French and signs still partly in the language. Even the local accent has a French twang. The quiet streets make it perfect for exploring via pushbike, and a guided tour is a must. For a more bustling atmosphere, make sure you head into the new part of town. The state capital of Chennai is where old and new collide. 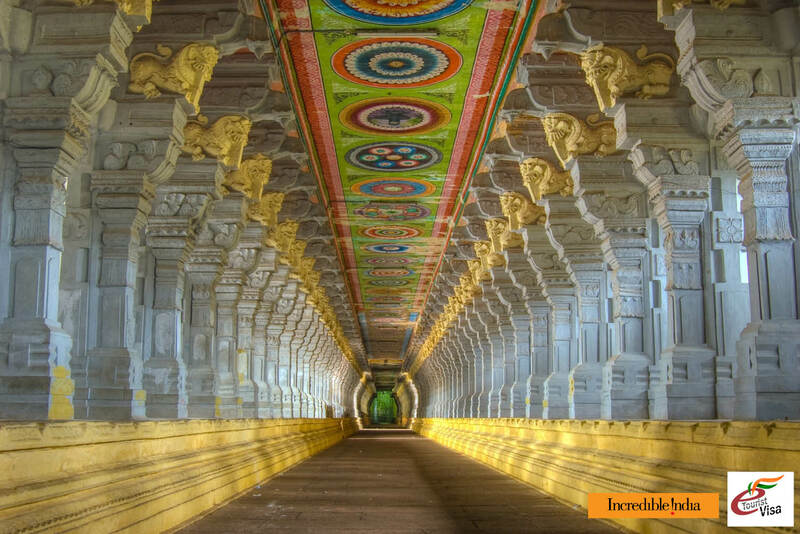 It has vigour, vitality and is jam-packed with some of the most beautiful and elaborate Hindu temples on Earth. 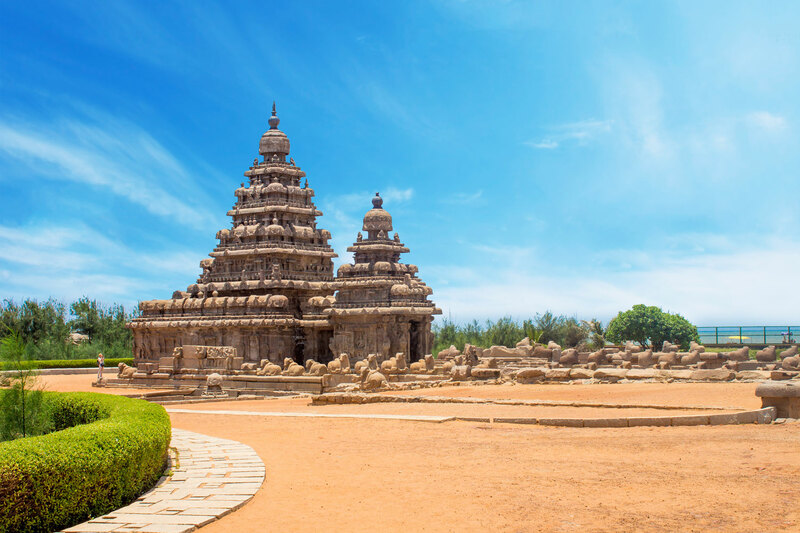 For example, you have to witness the overwhelmingly ornate Kapaleeshwarar Temple on the outskirts of the city, and if you can make it farther out, the monuments at Mahabalipuram date back as far as 1AD and constitute a UNESCO World Heritage Site. Back in town and it’s time to take in the dazzling city lights of this vibrant city. Dine at a rooftop restaurant, letting a cooling breeze wash over you as you eat, and be sure to finish with a cocktail overlooking the city – you can’t beat the pool bar at The Park hotel. If you are looking for accommodation in and around Chennai Tourism India has a very helpful search engine Hotel Cloud. The region of Chettinad in the south of the state has a particularly glamorous past. Once a hotbed of merchants and financiers known as ‘chettiars’, the area is filled with the sprawling mansions they built throughout the 19th and early 20th centuries. Today, many have been kept on as ancestral homes to be used for family events, even when the families themselves have moved to faraway trading countries such as Singapore, Malaysia and Burma. You can visit many of them while you’re there, and even stay in them – Chettinadu Mansion dates from 1902 and is now a palatial hotel. Each mansion showcases the travels of its owner – tiles from Spain, marble from Italy, teak from Burma… UNESCO is looking to categorise them as a World Heritage Site. Situated right on the beach, Chettinad also receives the benefit of cool ocean breezes. Not that you’ll need them – these mansions were designed to stay cool in the heat, and you’ll be amazed at how comfortable they feel, even on the hottest of days. UNESCO has also taken note of Tamil Nadu’s famous Western Ghats mountain range, designating it a protected World Heritage Site. High up in the mountains (at an average of 1200m above sea level) the air is cool and the lush views out across the forests will take your breath away. Head here to discover an abundance of wildlife, where you can catch site of Bengal tigers, Indian elephants and even Indian leopards. During the British Raj period, hill stations were built up here so ex-pats could keep cool in the heat of the summer. Stay at Rajakkad Estate, a timber-constructed boutique hotel dating back to the 18th century. It’s traditionally decorated, has views over the mountains and serves Tamil Nadu’s famous native food in the restaurant – think light vegetarian curries, crisp dosa and tender idli – with ingredients cultivated from the kitchen garden. They’ll even pack up your lunch so you can go off walking and eat it in the green surrounds of the hills. Yoga is encouraged, and visiting teachers are on hand so you can improve your skills (now you’ve got no excuse). Rameswaram is a small Island and Major Pilgrim Centre in the Gulf of Mannar. It is connected to the mainland by Pamban Bridge. This temple is located near the sea on the eastern side of the island. It is well known for its architectural beauty of magnificent Prakaras or corridors with massive sculptured pillars on either side. 197 metres corridor East to West believed to be the longest in the world and another corridor of 133 metres wide from South to North. This temple has undergone sea changes from 12th century under the reign of different rulers. If you’re looking for a holiday that involves culture, adventure and incredible landscapes, then Tamil Nadu is one you shouldn’t overlook. Situated in South India, but still incredibly close to Asia, this is a truly unique area, filled with incredible monuments and temples, history and culture. It’s a place to experience wanderlust, to find yourself and appreciate a part of the world entirely different to your own.